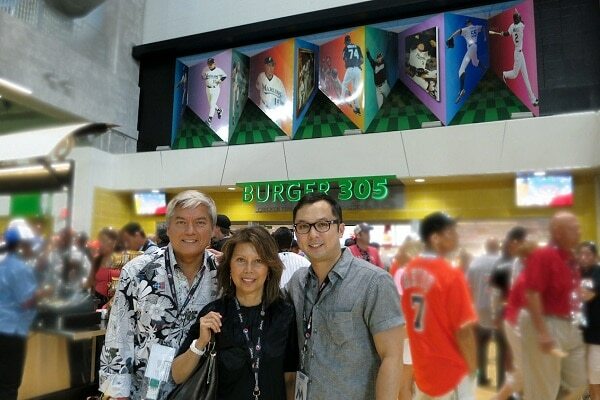 MIAMI, Fla. – This past March, international artist Dominic Pangborn participated in the historic grand opening of the new Miami Marlins ballpark. Construction of the stadium was completed at the end of March, just in time for Opening Day in April. Marlins Park is located in the Little Havana neighborhood of Miami, just west of downtown. Seated on the historic 42-acre site of the Orange Bowl, it features state-of-the-art amenities like a retractable roof and a 21st century contemporary style. When Dominic Pangborn was approached by the director of the stadium’s operations (familiar with his work) he agreed that this would be a very unique and exciting opportunity to exhibit to the Florida community. The Park West Gallery artist chose to highlight 10 years of Marlins’ history, designing a piece 10 ft. high x 40 ft. long x 4 ft. deep. Pangborn’s largest public piece to date, the work is created from vinyl transferred onto aluminum and is viewable from the stands, as well as home plate, the pitcher’s mound, first base and right field. The Pangborn installation has become the primary artistic highlight in the stadium. It’s featured on the official stadium tour and is located on the main mezzanine level above the concessions. Fine art by Dominic Pangborn is available for purchase through Park West Gallery and its cruise art auctions at sea. To learn more visit, parkwestgallery-pangborn.com.